Tales from Earthsea was released by Studio Ghibli in 2006 and was directed by Goro Miyazaki, who is the son of the great Hayao Miyazaki. It was based upon a set of books and short stories in the “Earthsea” series by Ursula K. Le Guin. The film tells the story of young Arren, son of the king, who steals his father’s sword, attempting to murder him, and runs away from home. Along the way, Arren encounters a wizard named Sparrowhawk who takes him under his wing. During this time, dragons have been seen in the air fighting each other, signifying an unbalance in the world. So Arren learns he must confront his fears if he’s going to be able to fight against this unbalance and help to restore it with the help of Sparrowhawk and a mysterious young girl. 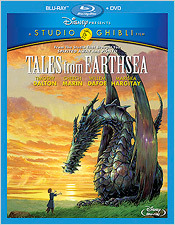 Tales from Earthsea, in all honesty, is a less than stellar title in the Studio Ghibli line-up. It’s one of the only truly fantastical movies that the company has ever released that lacks serious depth. Movies like Princess Mononoke, Spirited Away, and Howl’s Moving Castle have much deeper and more satisfying themes than this. I found my attention starting to wander more than once while watching Earthsea, as I waited for something more interesting to happen than the usual fantasy tropes. The only character that really comes close to having any substance is the young girl Therru, and even her backstory is pretty standard for this type of story. As always with Studio Ghibli films, Tales from Earthsea is beautiful to look at. The animation is great looking, but the overall product feels hollow. It’s almost as if someone had played “The Legend of Zelda” or read “Eragon” and decided to make an animated film in that vein. Earthsea is just another one of those epic fantasy films that feels pointlessly epic. There’s no real threat to the characters at any time in the story. I need a reason to invest myself in a story to stay interested. So Tales from Earthsea is a miss for me. I love and adore nearly all of the films Studio Ghibli has released, but this one falls to the bottom of the list for me. As for the Blu-ray transfer of the film, it’s a superlative presentation. Perfect in every way, there’s nothing to complain about. The thin layer of grain is unobtrusive, clarity and detail are quite deep, the color palette is perfectly represented, and both black and contrast levels are completely acceptable. There are no signs of digital enhancement of any kind, nor are there any signs of film debris left behind. The line art is crisp and the animation is smooth and fluid. There’s absolutely nothing to complain about in this regard. As for the audio, it’s almost as perfect. You get a couple of options: English and Japanese 6.1 DTS-HD, as well as an additional French 5.1 Dolby Digital track. The English and Japanese tracks are near perfection. There’s an enormous amount of speaker activity going on, especially in the rears with plenty of ambience for envelopment. Score and sound effects are crisp and effective as well. Dialogue is well-prioritized and clear, but I felt it could have mixed just a slight touch higher. There’s also plenty of LFE, used sparingly but effectively. Overall, this disc offers a very satisfying A/V experience. There are also subtitles in English, English SDH, and French for those who might need them. For the extras selection, there’s slightly more than I’ve seen in recent Studio Ghibli releases. There’s the option of watching the film in its original storyboarded form, plus the film’s original theatrical trailers and TV spots. There are also a pair of featurettes – The Birth Story of the Film Soundtrack and Behind the Studio: Origins of Earthsea – and a DVD copy of the film. To say that Tales from Earthsea is a disappointment is a bit of an understatement. And I don’t take into consideration that the director is the son of one of the finest animation directors in the world. It would be unfair to compare Goro to his father. It’s just that this film has so few merits. It’s standard fantasy fare. It’s boring, it carries little philosophical depth, and its characters aren’t all that interesting. Technically, it’s a marvel, but a heartbeat was needed to bring this thing to life. All that aside, at the very least, the technical quality of this Blu-ray release is sure to please.